Anonymous (Antwerp), Carved retable of the Passion of Christ, c. 1510. 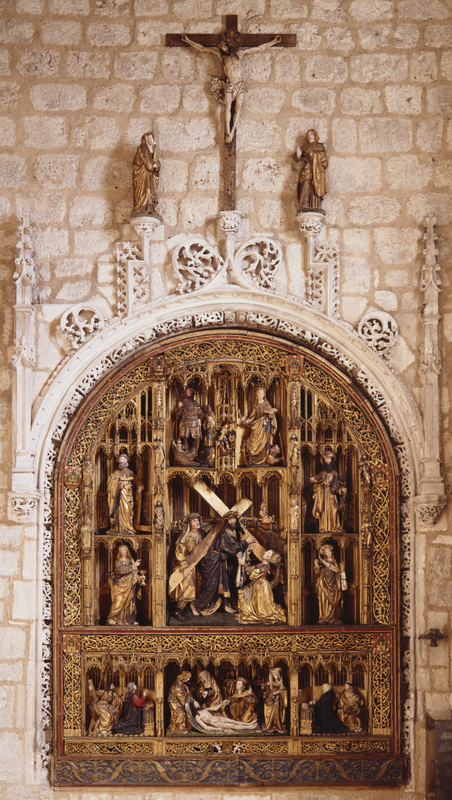 Burgos, San Lesmes, Capilla de Salamanca (Hans Nieuwdorp Archive, Illuminare – Centre for the Study of Medieval Art | KU Leuven). In 2010, Illuminare – Centre for the Study of Medieval Art (KU Leuven) acquired the archive of the eminent Belgian art historian professor Jan Karel Steppe (1918-2009). Steppe is internationally renowned for his groundbreaking research on the influx of Netherlandish art and luxury goods in fifteenth- and sixteenth-century Spain. By springtime 2016, his documentation will be archived and the inventory made accessible online. To celebrate this accomplishment, Illuminare is organizing an international conference on Steppe’s long-term and much loved research topic. This conference will focus on a large variety of media, ranging from painting and tapestry to broadcloth and astrolabes. Special attention will be paid to the driving forces behind this export-driven market, such as artists, patrons, collectors and merchants. By taking into account cultural, religious, political and socio-economic dynamics, this conference aims to shed new light on the multifaceted artistic impact of the Low Countries on the Iberian Peninsula in the fifteenth and sixteenth centuries. We welcome 20-minute papers by established and early career scholars that revisit or expand Steppe’s topics of research and, equally important, enhance these with recent methodologies and theoretical frameworks. The official language of the conference is English, although papers in French might be taken into consideration. Proposals of no more than 300 words and a brief CV should be submitted to drs. Robrecht Janssen (robrecht.janssen@arts.kuleuven.be) and drs. Daan van Heesch (daan.vanheesch@arts.kuleuven.be) by the 1st of October 2015. Speakers will be invited to submit their papers for a peer-reviewed publication on the topic. This entry was posted in Call for Papers, Conference and tagged call for papers, Netherlandish art on June 21, 2015 by James Alexander Cameron. I am an art historian working primarily on medieval parish church architecture. I completed my doctorate on sedilia in medieval England in 2015 at The Courtauld Institute of Art. Conference: Society of Architectural Historians' 72nd Annual International Confernce April 24, 2019 – April 28, 2019 Rhode Island Convention Center, 1 Sabin St, Providence, RI 02903, USA Sessions include 'Yours, Mine, Ours: Multi-use Spaces in the Middle Ages' (Co-Chairs Meg Bernstein, University of California, Los Angeles, and Catherine E.Hundley, Independent Scholar) and 'Architecture and Medieval Cultures of Containment' (Chair Kim Sexton, University of Arkansas). For a complete program, please go here. NUME Research Group on Latin Middle Ages Florence, Italy June 3, 2019 – June 4, 2019 The conference will be held from 3rd to 4th June 2019 at the ex Convento Il Fuligno, Florence, via Faenza 48n.